The phrase "the Church Suffering" most properly applies to the Holy Souls in Purgatory. The Church on Earth is referred to as the Church Militant (with the Church Triumphant being all those in Heaven.) Unfortunately, "the Church Suffering" was the phrase which came to my mind most often when reading the book by Fr. Matthew Despard: Priesthood in Crisis: One Priest's Experience. It's awful to contemplate. If even half of what Fr. Despard recounts is true (and Fr. John Abberton is of the opinion that his account does indeed ring true) then the Church in Scotland is in a shocking mess. The scandal of Cardinal O'Brien is merely the slightest tip of an iceberg which would sink a whole fleet of Titanics. Just as Michael Rose's book, Goodbye Good Men exposed the homosexual culture existing in US seminaries from the 1970s until as late as the 1990s, Fr. Despard's book makes it clear that the Church in Scotland resembles the Augean Stables. I couldn't bring myself to finish Goodbye Good Men, and I'm having problems reading Priesthood in Crisis. It is horrible. Apparently the further appointment of Bishops in Scotland has been put on hold until the whole sorry mess has been fully investigated by the Nuncio, Archbishop Mennini. It doesn't seem to be available at all now, in any format. But would you say that it's something one ought to read? It was never available in print, only as an e-book. 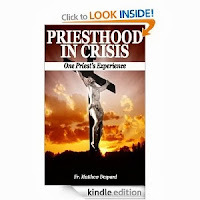 The book is available in the Kindle lending library. That's where I got it. No longer available on Amazon US, managed to buy on Amazon Spain.